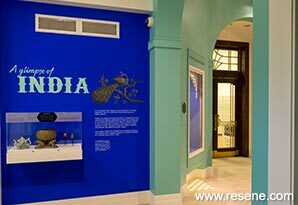 The opportunity was to work with artists and museum curators to design a contemporary art installation (Indra’s Bow) in tandem with an exhibition of Indian objects from the museum’s collection (A Glimpse of India). The approach for ‘A Glimpse of India’ was to create an environment that gave a sense of the place the objects were from. The space is octagonal, with a high ceiling and four arched entranceways. Within the four inset vitrines, lattice inserts were designed and painted in Resene Quarter Pearl Lusta to echo the arches and frame the objects in a distinctively Indian manner. ‘Indra’s Bow’ is an immersive and sensory art installation in an adjoining space, featuring a rainbow of spices, flowers and other fragrant ingredients suspended in the air. A mandala created in rice covers the floor, incorporating wax flowers and diyas (lamps). 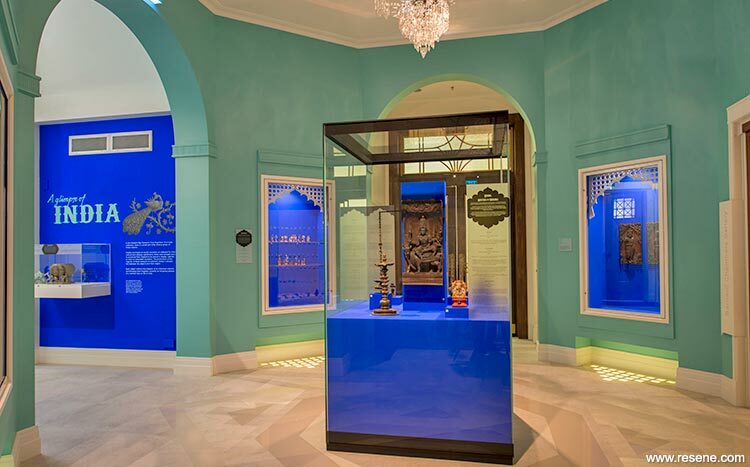 The scents suffuse into ‘A Glimpse of India’, enhancing the experience of both exhibitions. 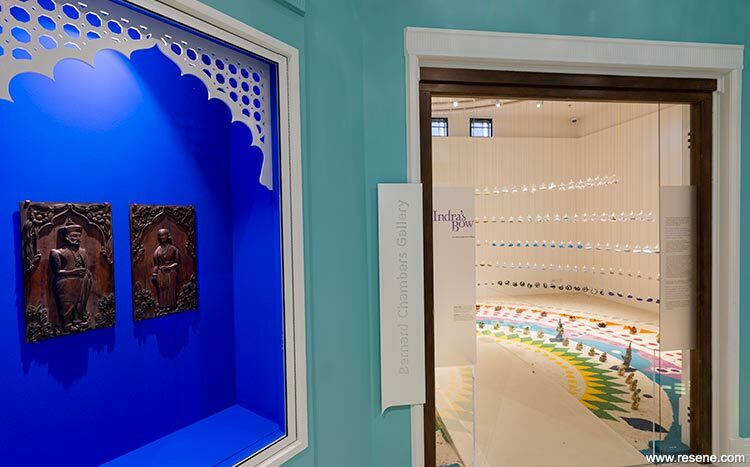 In ‘A Glimpse of India’ a vivid blue was chosen for the vitrines, inspired by the peacock, India’s national bird, while the Resene Onepoto of the walls evokes a commonly-used wash on Indian buildings. Together these colours create a rich, vibrant setting evocative of India. The walls in ‘Indra’s Bow’ were kept neutral with Resene Quarter Pearl Lusta and unadorned to focus the eyes on the colours and textures within the glass vessels. Resene Zylone Sheen is used for the exhibition spaces, due to the flexibility offered by the extensive colour range, the unobtrusive low sheen finish and the low or no added VOC in enclosed spaces and around sensitive artworks. Resene Digital Blue from the Resene FilmPro range was chosen for the case interiors. The intensity and saturation gives great depth and allows the objects on display to pop against the vibrant background.